Did you realize that Lois Enigma is an anagram of Gail Simone? No. After all, who would?! So when I saw "Lois Enigma" tweeted yesterday I realized that there must be an online anagram-maker to construct something like that. And yes, there certainly is. In the interest of science I decided to take it for a spin. Maybe you wondered what the title of this article could possibly have been referring to? Yeah Brains is an anagram of Brian Hayes and Boozy Afghan Elm is a reworking of Hayfamzone Blog. As if there weren't enough ways to waste time on the internet. Now let's put this anagrammer to work on something important. When I input Jack Kirby, I get Kick By Jar. That's not so great. Try Jacob Kurtzberg instead and one output is Czar Bob Trek Jug. Hm. You can test out the function for yourself over here. 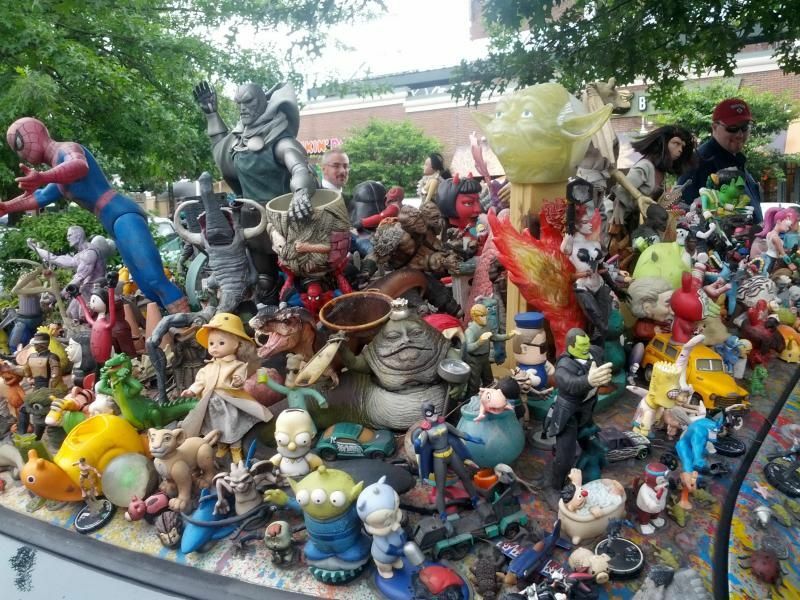 Drive around Cambridge, Massachusetts and you'll see many things. 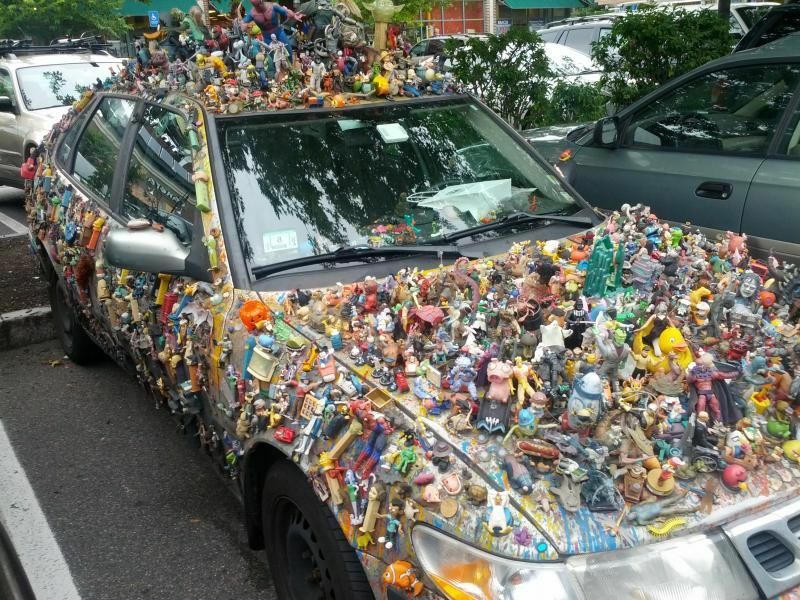 If your timing is just right, you'll see this one-of-a-kind car. Maybe I would call it a Hootenanny of Popular Culture. Here's a closer look at the hood. You'll want to zoom in on the roof also. Hey, I see The Vision (or is that Doctor Doom?). Here is an article that identifies the owner as Rebecca Perlo. No, you can't drive the car. But you can look at it. I think it's very fun to look at! Yes, there was a costumed character on one episode of Dragnet. That episode aired in 1969. Amazon Instant Video describes the story as "Sgt. 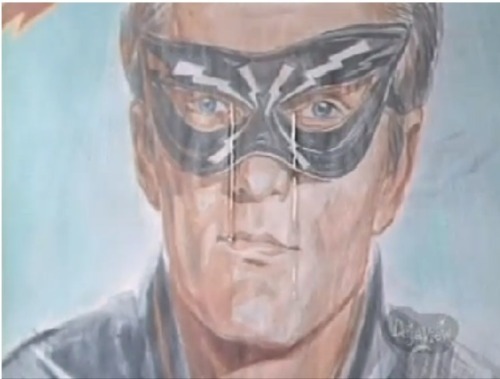 Friday and Officer Gannon search for a burglary suspect dressed in a bright green cape and Napoleon hat who only steals photos of an old comic-strip hero," and Amazon will be pleased to charge you $1.99 to watch that show over here. But wait! Don't click that mouse! I have found the show for you to watch at no charge. (Your subscription fee to The Hayfamzone Blog keeps paying for itself over and over again, doesn't it?) Here are the first 15 minutes of the episode, and here are the closing 11 minutes. Enjoy! Back in 1971 around the time Jack Kirby was creating the first issues of Spirit World and In The Days of the Mob, Mr. Kirby envisioned another black and white project for DC Comics. It was to be entitled Superworld, or maybe The Superworld of Everything. The package would have contained comics work by Mr. Kirby, like a series about the Astro-Chicks. There was to have been something in there by Harlan Ellison also. (You can read a little more of the history of Superworld over on this page.) Unfortunately the project did not get beyond the concept stage and all that exists to remind us of what might have been are a few wisps of smoke and a proposal flier that you see portions of above. Too bad! But, if you can believe it, a copy of that flier is up for bid from Larry Shell on ebay this very minute, right over here. The Artist Within is huge and features photographs by Greg Preston. The book is an interesting one that displays large, full-page photos of the drawing tables of comic book artists. I like that Jack Kirby and his drawing board are on the opening pages of the book. How appropriate! Also included are Sergio Aragones and Will Eisner and Russ Heath and Patrick McDonnell and many, many others. This book gave me my first view of many artists whose work I have appreciated for a very long time. But, inexplicably, Mr. Preston and his editors forgot to contact me and I don't mind correcting the unintentional oversight right here and now. 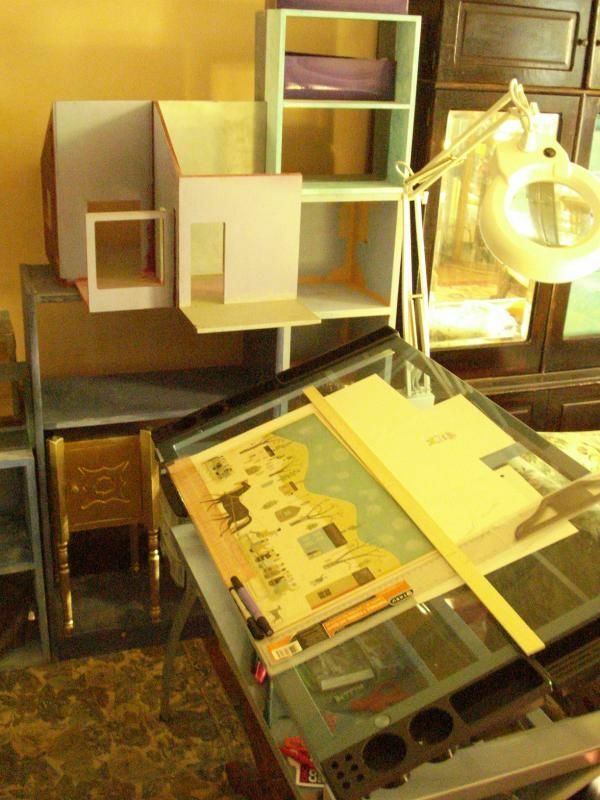 Up above is a photo of my Futura drawing table. You might ask why there is a print by Doris Lee sitting on the tabletop. Well, we like her artwork, and also I like something to be on that tabletop during the months that I don't get around to sitting down to draw. You might also ask why the table is positioned next to a deserted dollhouse, but for that answer I'll have to defer to the psychotherapists among you. A photo of Joe Kubert and his drawing table is in the book, but I prefer the below photo of them. The picture in the book relegates Mr. Kubert's table to the background but this image emphasizes its massiveness. Wasn't it as huge as a football field?! The cover price of The Artist Within is very reasonable considering its size and quality, but still let's see if we can get you a deal over on ebay. I highly recommend this book! Take a look up above at the logo of the latest incarnation of Nova from Marvel Comics. And now take a look down here at the logo of the PBS television series of the same name. What's up with this? 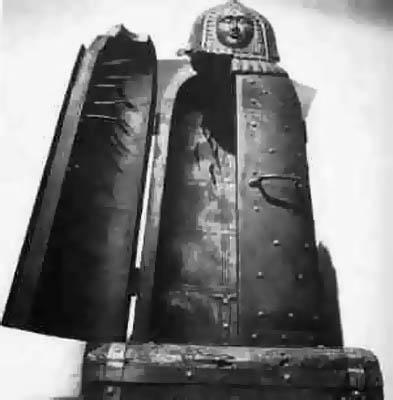 Aren't the two designs, like, basically the same (except for the fact that the top one's internal organs seem to have been compressed by an Iron Maiden)? I think Marvel would have been better off sticking with or just tweaking their 1970s version, which at least had a little bit of character (but let's not talk about the"O"). If you're going to do something new, shouldn't it be better? 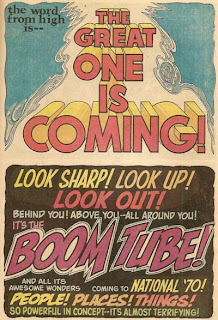 We've been hearing about Boom Tubes since 1970 even before the first Fourth World title ever hit the stands (as you'll be reminded by the 1970 DC Comics house ad down below.) These fine Jack Kirby teleportation devices are now omnipresent in the DC Universe and that's a great thing. 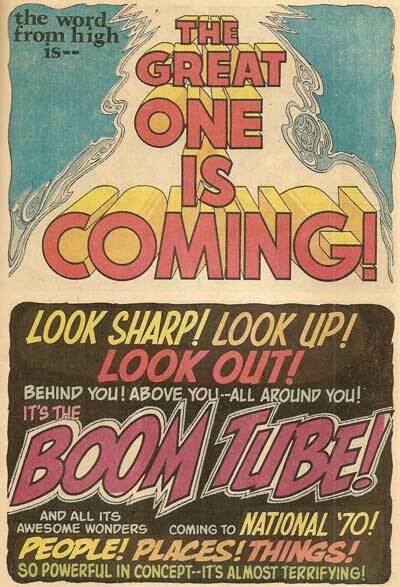 But it seemed back in the day like we would only see somebody entering or exiting the Boom Tube; we never really got a view of the inside of the vessel. The recent Wonder Woman #21 changed all that and, as you can observe in the above panels from that issue, Brian Azzarello and Cliff Chiang finally gave us the vantage point we didn't realize we had been missing. Mr. Azzarello went even a step farther and articulated a perfectly reasonable limitation to the functionality of the Boom Tube: for the passengers to be able to exit at the other end of the Tube, the entrance they had come in through has to close. Great! Why not? I like very much when a latter-day creator enriches a long-existing concept without violating the spirit of the original concept in any way. As far as I'm concerned Brian Azzarello has earned himself the keys to New Genesis. And if the gentleman ever tires of Boom Tube travel he most certainly has my approval to ride the Dream Machine or the Glory Boat or the Mountain of Judgment. Vrooom! Last year I told you about a cable TV channel that was covering the San Diego Comicon but, unfortunately, that coverage does not exist this year. We do have the above reports from Patrick McDonnell about the goings-on at the convention however. Luckily! My favorite Walt Simonson artwork was what he drew for Manhunter and Hercules Unbound and The Metal Men and The Rampaging Hulk. You might say I'm (gulp) stuck in the 70s! I look all around when I'm on the internet to see what I can see and I came across something I found very interesting. On twitter Mr. Simonson has over 9000 followers but he follows exactly 12. I was curious to find the identities of those 12. It turns out they include Jim Steranko, Phil Jimenez, Mike Mignola, Bryan Hitch, Dave Gibbons, Cully Hamner, Jimmy Palmiotti, Scott Dunbier, Kurt Busiek, and a couple of folks I don't know. Like I said, I found this interesting. Maybe you would find it interesting to read again the postcard that Mr. Simonson wrote to me back in 1980, which you can do right over here. Alex Toth, Illustrated and Alex Toth, Isolated are two big and beautiful art books devoted to one of the most stylistic comic book artists of all time. The titles and cover designs of the two books are so similar that at first I thought they were different editions of the same content, but no, they are entirely different and complementary volumes. 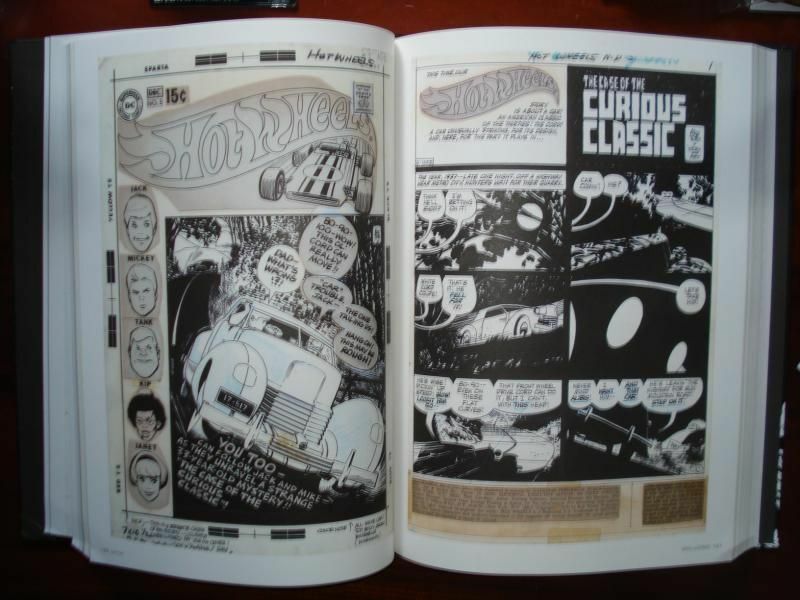 My first encounter with the artistry of Mr. Toth was the newsstand release of Hot Wheels #1 in 1970. I was just a kid at the time but it would be clear to anyone that what I saw was not like the artwork in other comic books. It has been my pleasure since then to investigate more and more of Mr. Toth's luxuriously economical drawings. In these two books many pages of artwork are reproduced, some of them from the originals (in black and white) and others from the printed comics (in color). I recommend both books highly, and over here you can check if ebay has a deal for you on them. Good luck! 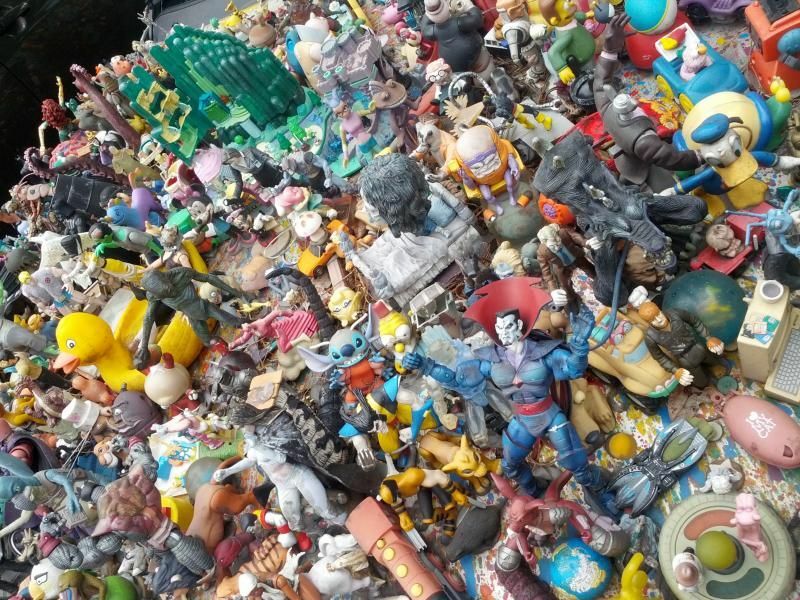 An artist in Brussels who goes by the handle ADN is involved in an ongoing project of his own design in which he seems determined to Simpsonize every character in popular fiction. 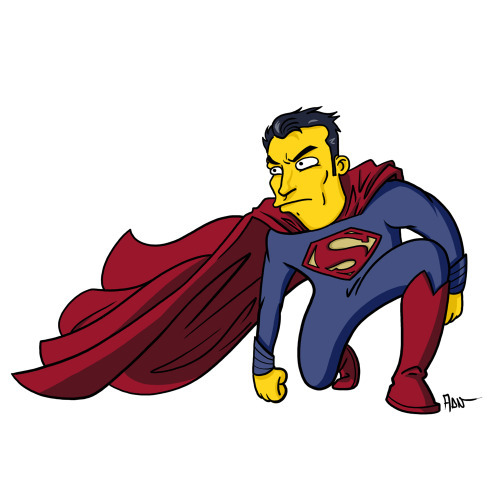 The Superman and General Zod I'm showing are only the tip of the Springfield iceberg, and the artist states a personal goal of posting one new design every working day. If you're a fan of Breaking Bad or Game of Thrones (as ADN must be) you're really in luck because it looks like every single character from those two series has been touched by the brush. 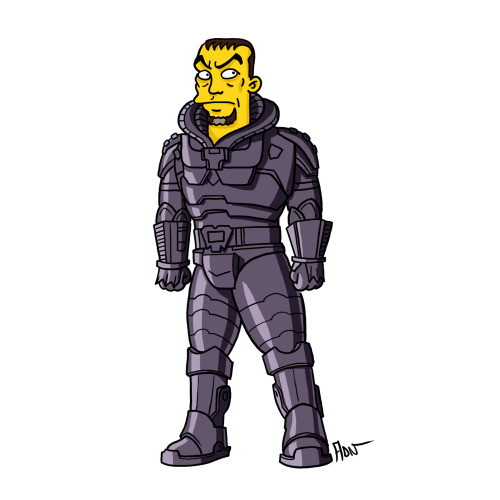 You can investigate ADN's Simpsonized designs for yourself right over here. 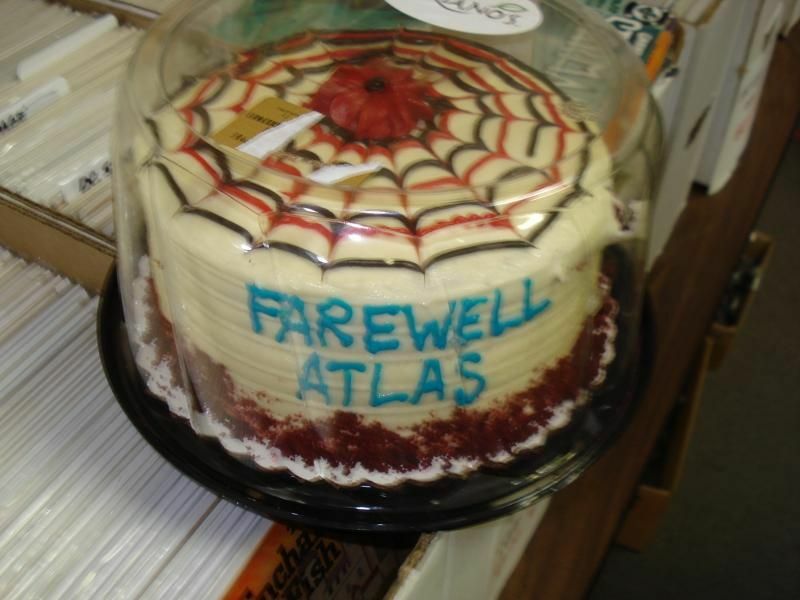 It was quite a send-off! Tinges of sadness were not weighing down the air one bit seeing as how the day marked more of a beginning than an ending. Down below you see John McInnes and John Stangeland and Mike Dennler. Thanks guys! This past weekend the new Beware the Batman show debuted on the DC Nation hour block of Cartoon Network. 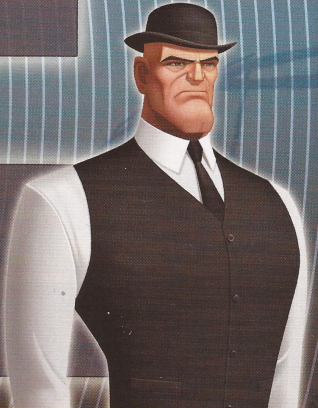 A peculiarity of the series is that they've made Alfred a bald-headed bruiser (believe it or not, that's our beloved butler in the picture above) instead of his more usual role in the universe as a patronly mentor. Aside from that one bump in the road it's a pretty fun ride and I will continue watching future episodes. Of course everybody knows Krypto the Super-Dog, but how many of these other pets do you recognize in the above panel from the recent Superman Family Adventures #12? 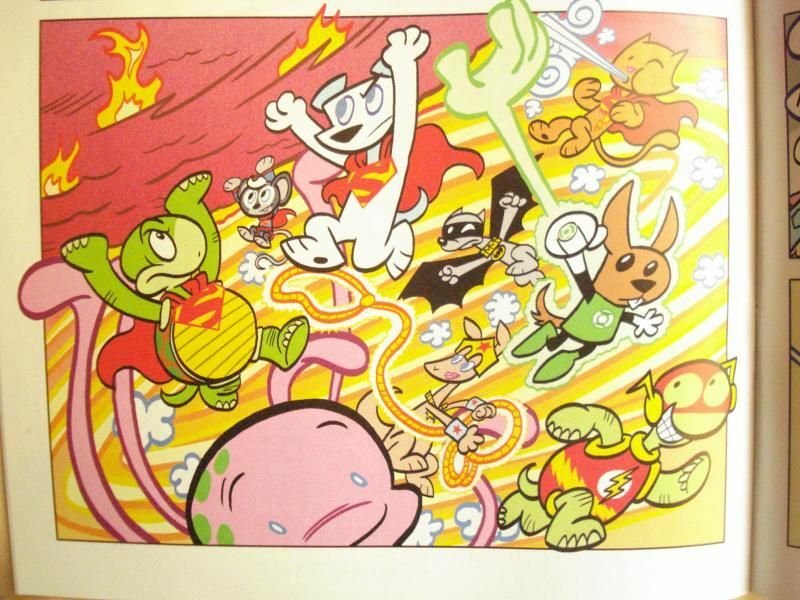 Streaky the Super-Cat is Supergirl's friend. Ace the Bat Hound has wings these days? Super Turtle came from the fertile mind of Henry Boltinoff. Topo the Octopus showed up grown up in Aquaman's comic book a month or two ago and this pet is no longer as cute as he appears above. Kanga is (obviously) from Wonder Woman. That little squirrel Green Lantern is Ch'p (and please don't say G'nort). 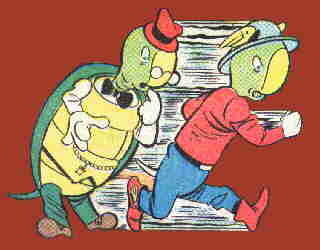 Dating back to 1940s issues of Funny Stuff is the Flash send-off known as The Terrific Whatzit (who was so beautifully drawn by Martin Naydel those many decades ago). And hmmm, Atomic Mouse seems to be on loan from Charlton Comics. Many thanks to Art Baltazar for a drawing as fun as this one! And did you hear that Art and Franco have received a Harvey Award nomination for their work on S.F.A.? "Superhero Alter Egos" on Jeopardy! This week the Jeopardy! game show had a category about comic book characters, but the contestants did not do very well in it. One player did answer correctly that Bruce Banner is The Hulk but nobody knew the superhero identity of Oliver Queen or Barbara Gordon or Ben Grimm. Isn't that a shame? I believe that Christine Valada would have known all of those clues (and many more). 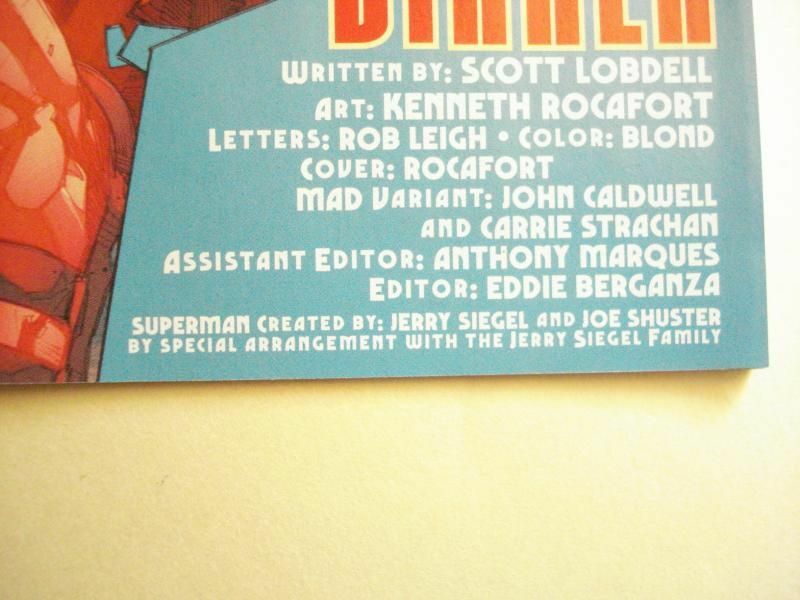 by special arrangement with the Jerry Siegel family"
By now you've seen the above line that has been appearing in every Superman comic book for the last month or two. It seemed very unusual the first time I saw it so I looked up the details. That line still seems unusual. Get my lawyer on the phone! I'm fairly certain I remembered to send in the forms to patent adding "ing" to words to name new activities. Well, now DC Comics is inviting everyone to go out and do some ClarkKenting. By that they mean taking a photo of someone pulling their shirt open to reveal a Superman S, just like in the Alex Ross painting above. You can read about DC's preposterous scheme over here. Me? I'd rather be Kirbying. On page 4 of the new writer's first issue of Green Lantern, the title character utters the sentence "We're done for." I would have had to sit down if I wasn't already seated. I turned the page of the comic book in disbelief to see if what I had just read was a gag or hallucination. But it wasn't. The point, of course, is that Hal Jordan would NEVER say those words. I've been spoiled. For years now my favorite current DC comic month in and month out has been Green Lantern as written by Geoff Johns. He added so much substance and texture to the Lantern mythos without damaging anything that had come before. Even his send-off issue last month was spectacular, a wonderful confluence of so many of the concepts that he had introduced (although the number of pages in that issue devoted to testimonials to Mr. Johns was a bit over the top). My expectations for the new writer were admittedly high, but I never expected to read anything like "We're done for" in the very first non-Johns story. To have a fearless, never-say-die character say something antithetical to his very being just four pages into the new writer's run? Really? @hayfamzone Hal isn't a hero because he doesn't know fear. He's a hero because he perseveres in spite of it. @hayfamzone It's what he does after he thinks he's "done for" that counts. By now you've heard that DC Comics will be winking at a past age by publishing Batman '66. If they are so anxious to embrace a bygone era I would prefer that it be the Golden Age of Comics, but so be it. To ballyhoo the publication of the first digital issue of Batman '66, DC posted an article listing other DC-centric events that took place in the real world in the year 1966. Two of the items they post refer allegedly then-popular Batman songs that I have never previously heard one whisper about. So I had to investigate. The Riddler was sung by Frank Gorshin and written by Mel Torme, and you can hear it here. Interesting. Batman and His Grandmother was by Dickie Goodman, and you can listen to that one over here. Also interesting. And while we're exploring those Dark Ages we might as well watch Batman himself as he dances the Batusi. Excuse me now while I run screaming back into the future. John Byrne has been quoted as saying "The only award that really means anything to me is a fan coming up and saying Thanks." I am in total agreement with the gentleman that a word of thanks is the best way to greet a comic creator. I certainly said it when I shook Joe Kubert's hand last year, and just a couple of days ago I tweeted "Thank you for all the wonder" to Mr. Jim Steranko. I have never attended the San Diego Comicon but, if I did, I would be saying a lot of thank you's! In an Independence Day tweet to his followers this morning, Batman fan Kevin Smith referred to The United States of America as "the Batman of nations." I like that metaphor! KevinSmith @ThatKevinSmith 31m Happy #4thOfJuly, my fellow Americans! We live in what is most certainly the Batman of nations! To all other countries: enjoy your #July4th! News relating to the world of comic books is my favorite kind of news. 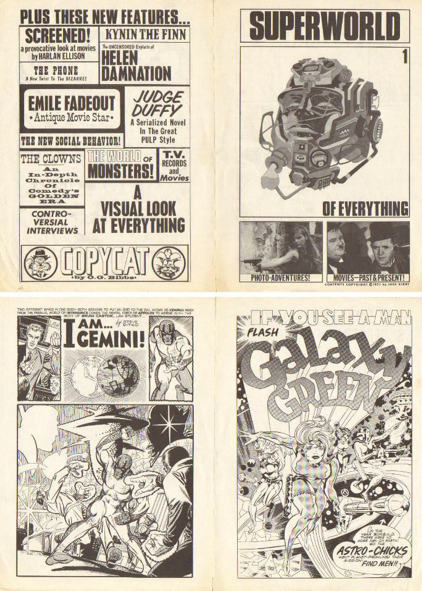 In late 1972/early 1973 I received my first subscription issue (#19) of The Buyer's Guide for Comic Fandom and I got my first taste of comic book news from Murray Bishoff's Now What? column. Around the same time I started getting Jim Steranko's excellent ComixScene, and not long after I was so pleased to discover The Comic Reader. I wanted to know everything about the upcoming comics and those publications were my means to that end! These days newsarama.com is my main source of information, but I got a blast from the past when reading yesterday's New York Times. The headline screamed out at me: Vertigo, a DC Brand, is Rebuilding with 6 New Series. Was the daily newspaper actually informing me of some comic book news that I did not already know? Well, no. It turns out I knew about those new series already, but still.I like it when comics get some press coverage for something other than sensationalizing the death of a long-running character (who will be resuscitated in fairly short order anyway). 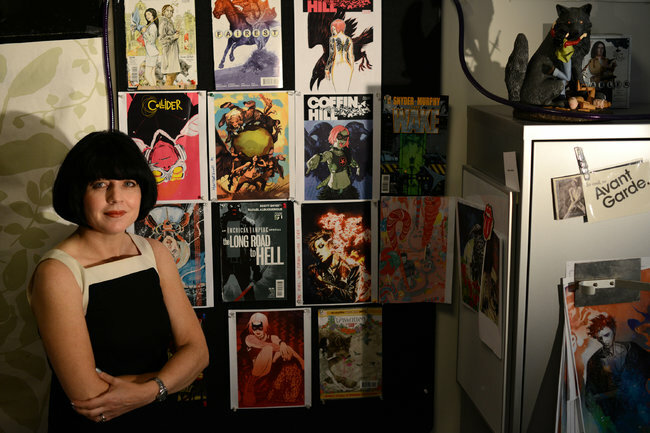 The article presented the above photo of Vertigo Executive Editor Shelley Bond, and you can read it for yourself over here. This past weekend the American Library Association held its annual convention in Chicago at McCormick Place (the same city-unto-itself where C2E2 was held a couple of months back). 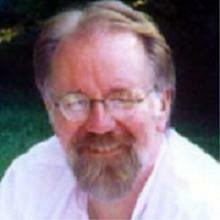 The reason this might interest you is that some comic book creators made appearances there!